What is Hashimoto's thyroiditis? Where is ithe thyroid gland located, and what does it look like? What are the signs and symptoms of Hashimoto's thyroiditis? What about Hashimoto's thyroiditis and pregnancy or trying to conceive? Is there a special diet for someone with Hashimoto's thyroiditis? What tests diagnose Hashimoto's thyroiditis? What are the treatment options for Hashimoto's thyroiditis? Is there a cure? Are there natural treatment treatments for Hashimoto's thyroiditis? What is the prognosis for someone with Hashimoto's thyroiditis? Can it be prevented? Hashimoto's thyroiditis (chronic lymphocytic thyroiditis) is an autoimmune disorder that causes inflammation of the thyroid gland. Hashimoto's thyroiditis is the most common cause of hypothyroidism (low thyroid hormone levels in the blood) in the United States. Hashimoto's thyroiditis is diagnosed by blood tests that measure thyroid gland function and blood tests that look for antibodies against proteins found in the thyroid gland. Treatment options for Hashimoto's thyroiditis are oral thyroid hormones to maintain normal thyroid hormone levels. Since Hashimoto's thyroiditis is an autoimmune disorder it cannot be prevented. The prognosis for someone with Hashimoto's thyroiditis is excellent with proper treatment. The condition was named after Dr. Hakaru Hashimoto, the doctor who described it in 1912. Hashimoto's thyroiditis is an autoimmune condition that is a common cause of hypothyroidism. In Hashimoto's thyroiditis, the body mounts an immune reaction against its own thyroid gland tissue, leading to inflammation of the gland (thyroiditis). The thyroid is a butterfly-shaped gland located in the lower part of the neck, below the Adam's apple. The thyroid gland wraps around the windpipe and has a shape that is similar to a butterfly - formed by two wings or lobes (lobes), and is attached by a middle part. As hypothyroidism becomes more severe, there may be puffiness around the eyes, a slowing of the heart rate, a drop in body temperature, and heart failure. In its most profound form, severe hypothyroidism may lead to a life-threatening coma (myxedema coma). In a severely hypothyroid individual, myxedema coma tends to be triggered by severe illness, surgery, stress, or traumatic injury. This condition requires hospitalization and immediate treatment with thyroid hormone. Hashimoto's thyroiditis can be easily treated with thyroid hormone replacement, if it is diagnosed properly. Untreated hypothyroidism can lead to an enlarged heart (cardiomyopathy), worsening heart failure, and an accumulation of fluid around the lungs (pleural effusion) or heart (pericardial effusion). People with Hashimoto's thyroiditis often initially experience a hyperthyroid phase (too much thyroid hormone), called hashitoxicosis, as thyroid hormone leaks out of the damaged gland as it is destroyed. Eventually, they become hypothyroid. Hashimoto's thyroiditis is not a reason to avoid pregnancy. However, some women with Hashimoto's thyroiditis do have trouble conceiving. In addition to careful obstetric care, management of thyroid hormone replacement by an endocrinologist is helpful. Before conception and during pregnancy, levels of thyroid hormones need to be monitored and optimized by checking TSH levels, and if necessary, adjusting the medication dose. The target goal is usually within the range for nonpregnant women but at the higher end of the normal range. People with Hashimoto's thyroiditis do not need to follow a special diet. There is no evidence to suggest that specific foods have any effect on worsening or improving the condition. To diagnose Hashimoto's thyroiditis, a physician should assess symptoms and complaints commonly seen in hypothyroidism, carefully examine the neck to look for enlargement of the thyroid gland, and take a detailed history of family members. Blood tests are essential to diagnose Hashimoto's thyroiditis. Specific blood tests determine the level of thyroid function. During the early stage of thyroiditis, the levels of thyroid hormones (T3 and T4) may be normal. With chronic hypothyroidism, the thyroid hormone levels fall, and the level of thyroid-stimulating hormone (TSH) becomes high. The most useful assay for determining thyroid status is measurement of TSH in the blood. 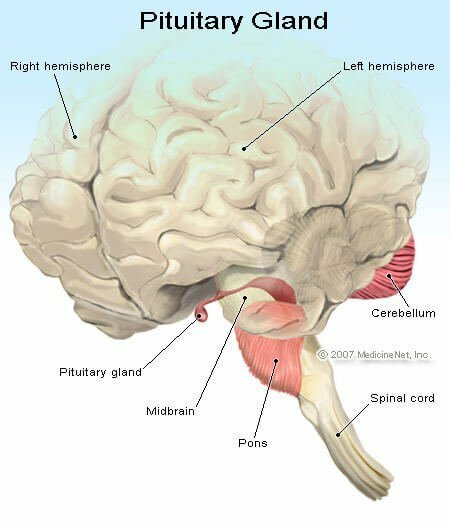 As mentioned earlier, TSH is secreted by the pituitary gland. As the level of thyroid hormone falls, the pituitary gland responds by releasing more thyroid-stimulating hormone (TSH). The increase in TSH can actually precede the fall of thyroid hormone to low levels by months or years, so the first sign of hypothyroidism may be an elevated TSH level even when levels of thyroid hormones are normal. The blood work mentioned above confirms the diagnosis of hypothyroidism, but does not point to an underlying cause. The combination of the patient's clinical history, antibody screening (as mentioned above), and a thyroid scan can help diagnose the precise underlying thyroid problem. If a pituitary or hypothalamic cause is suspected, MRI of the brain and other studies may be warranted. These investigations should be made on a case-by-case basis. The blood tests also usually include an analysis of antibodies (anti-thyroperoxidase antibodies) to aid diagnosis. If the anti-TPO antibodies are elevated at all, the diagnosis is made. Early on in the course of the disease, however, the patient may have negative antibodies. If the gland is large, or there are symptoms of esophageal compression, an ultrasound may be performed to see if the gland is compressing either the esophagus (the food tube) or the trachea (the airway). There is no cure for Hashimoto's thyroiditis. The timeframe of the autoimmune process and inflammation will continue is not predictable. In the vast majority of patients, hypothyroidism results from the inflammatory process. Thyroid hormone medication can replace the hormones the thyroid made before the inflammation started. There are two major thyroid hormones made by a healthy gland (T3 and T4). Replacing one or both of these hormones can alleviate the symptoms caused by the absolute or relative lack of hormones as a result of Hashimoto's thyroiditis. The treatment of choice for Hashimoto's thyroiditis is typically synthetic T4 or thyroxine (levothyroxine). Brand names for this medication include Synthroid, Levothroid and Levoxyl. The medication must be taken indefinitely, and successful treatment alleviates the symptoms and signs of hypothyroidism. Without medication, there is very little chance the thyroid would be able to maintain hormone levels within the normal range, and symptoms and signs of hypothyroidism would occur or worsen. The dosage of levothyroxine may need to be modified after checking TSH levels once yearly. Adjustment of the dose may also be required in pregnant women. Treatment of Hashimoto's thyroiditis involves administration of prescription thyroid hormones. There is no scientific evidence that natural treatments are able to reverse hypothyroidism. The prognosis for someone with Hashimoto's thyroiditis is excellent with proper treatment. Restoration of thyroid hormone levels with medical treatment will reverse the signs and symptoms of hypothyroidism. Without treatment, hypothyroidism can worsen over years, potentially leading to organ damage and severe illness. Hashimoto's thyroiditis is an autoimmune condition in which the body perceives its own tissue as foreign. There is no known way to prevent this condition. REFERENCE: Lee, S. MD. Hashimoto Thyroiditis. Medscape. Updated: Mar 02, 2018.